Only one thing hurts about my gym membership and it’s not my muscles after a decent workout. It’s my wallet. I’m the first to admit I don’t get to the gym nearly as often as I should and it is hard to justify the cost of something I don’t really use. On the other hand, I do get to the park almost every day so perhaps it’s time to take a new approach to fitness. Personal trainer Chris Rauchnot developed Playground Pump in response to the number of parents who complained they didn’t have time to get to the gym (yes, that’s me) yet just sat and watched their children play at the playground, (um… think that applies to me as well). Kids spend their time at the park swinging, hanging, climbing and running but never think of it as their exercise. Rauchnot recognized that playgrounds offer lots of exercise opportunities and set about adapting traditional gym workouts to play equipment. The result is Playground Pump. 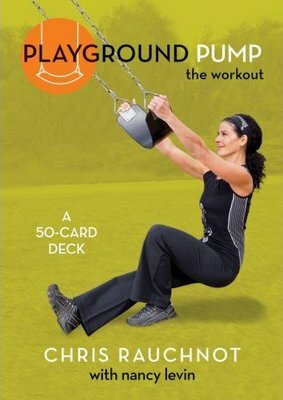 Playground Pump is available in two formats – as a deck of cards that is portable or as an iPhone app. I went with the app as I always have my phone with me (and therefore no excuses). Shuffle through over forty exercise cards to create your own workout or, with the app, create a workout from six randomly selected exercises. A warm-up, six exercises and a cool-down stretch takes approximately half an hour and the beauty of Playground Pump is that every workout can be different and you can adapt your regime to different playgrounds. Just because it is in the park don’t think it’s all child’s play. 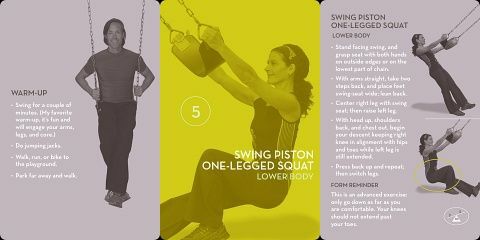 Some of the exercises are tough and I must admit that after a set of the upper body Swing Seat Row and Swing Superman exercises I could barely open a jar for a week without every muscle in my arms and shoulders reminding me of my half hour in the park. Playground Pump cards are available from Amazon for US$12.44 or the iPhone app is $3.99.